Livability describes a variety of factors including a choice of housing options, access to employment, schools, hospitals, shopping, and recreation, as well as reasonably safe and secure surroundings. Efficiency concerns how land is used and relates to the provision of both infrastructure and social facilities and services. In a growing region, an important challenge includes using existing infrastructure more effectively rather than abandoning it in favour of investment in entirely new facilities and services. Affordability largely involves achieving a realistic tradeoff between expectations and fiscal resources that can be made available, an increasingly difficult task at a time when all governments are seeking to reduce (or at least not increase) taxation. Environmental protection involves both mitigation against well-known negative impacts associated with urban growth, as well as righting some of the wrongs that have already occurred. Thus, it involves elements of soil and water reclamation, improving air quality, and reducing greenhouse gas emissions. reviving small-town characteristics and pleasant streetscapes within local communities that collectively form large urbanized regions. making adequate and appropriate investments in a balanced transportation system to (a) provide a cost-effective competitive transit alternative to the automobile in markets where such competition is feasible, and (b) ensure the cost-effective and timely movement of goods and services within and through the Central Ontario Zone. Table 5.1 provides a cursory summary of the extent to which each of these elements are likely to be applicable in each type of community. Clearly, transit system improvements and associated residential and employment densification (either through infill or new development) apply most directly to the more urbanized portions of the Central Ontario Zone. However, it is never too early to develop in a transit-supportive way (in terms of ensuring a mix of uses, paying attention to roadway and streetscape design, or focusing major employment into concentrated activity centres) in anticipation of eventually developing a viable transit system as the community grows. Further, experiments with transit alternatives suited to lower-density communities (for example, van pooling, dial-a-ride, route deviation services, or jitneys) should be encouraged. As has already been discussed, mixed uses and other neighbourhood design features aimed at promoting walkability should be emphasized in all development projects at all urban scales. This is, however, often easier to do at either the small town scale or in urban centres. A major smart growth challenge is going to be how to retrofit the large number of single-use, auto-dominated suburbs within the GTA and elsewhere into more walkable neighbourhoods. 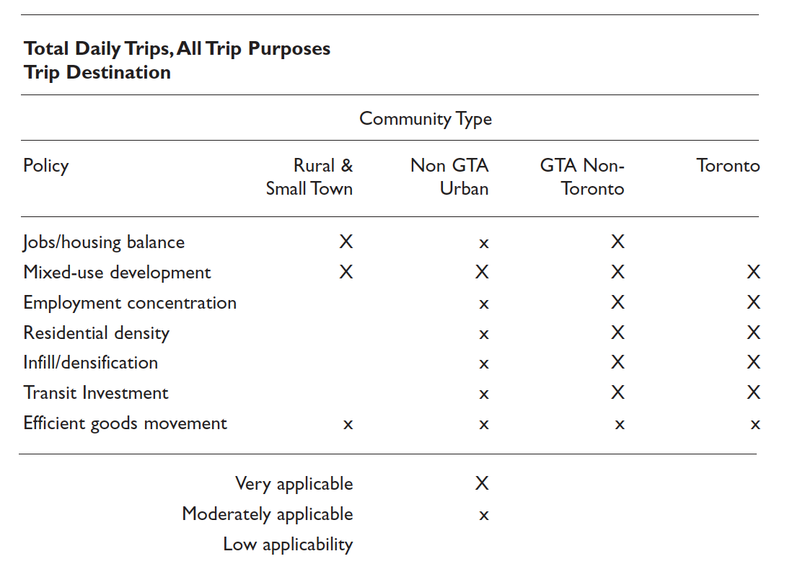 In the particular case of smaller communities, not only will this reduce auto dependency for local trip-making, but it will also contribute towards maintaining some of the small-town attributes that typically make such communities attractive places to live and work. Further, even in rural communities and small towns, land should be treated as a scarce resource. Thus, compact development should be preferred, not just for transportation efficiency reasons, but to preserve as much as possible of the natural and rural environment that is critical to the community's quality of life. The issue of jobs/housing balance has not been discussed in detail to this point in the paper, although it is one that has attracted considerable attention in the transportation and urban planning literature. Conceptually, it is clear that if, on average, workers live closer to their jobs, then less total travel is required for commuting and (more often than not), alternatives to driving a car are more feasible. Given the high level of residential and employment mobility, the diversity of household tastes for residential lifestyles, and the complexity of urban spatial economies, it is questionable to what extent an optimal jobs/housing balance can ever be achieved, or the extent to which a very rigid enforcement of such a balance is even socially desirable. However, it is clear that a considerable amount of "excess commuting" occurs within the Central Ontario Zone because of the continuing development of residential bedroom communities on cheap land far removed from the employment centres that provide the jobs for the workers living in these communities. Such development is presumably rationalized as a means of providing affordable housing for low- to medium-income households, a way to improve a community's tax base (although it also increases the services that need to be provided from this tax base), and as a "natural" early stage in the urbanization process for the community. Further, as one can see in older suburban developments built in this style, once the original, single-use, auto-dominated community style has been established, it is very difficult to retrofit it into a more efficient urban form. In addition, leapfrog development encourages additional low-density, auto-dominated infill between the leapfrog community and the previous urban boundary and tends to preclude more orderly, efficient, and transit-oriented development. While the development of bedroom communities can and has occurred throughout the GTA and other urban regions within the GTA, this issue is perhaps most critical for small towns and rural communities located in the outer portions of the GTA or outside the GTA altogether. For many rural or small town communities, smart growth might mean very little or no growth, since with significant growth often comes loss of many of the attractive attributes of rural and small town life. To the extent that growth is allowed in such communities, however, it should occur in such a manner that these desirable attributes are maintained or even enhanced whenever possible. Ideally, development in such areas should be balanced between jobs and housing, with employment taking the lead, to promote self-containment as much as possible. Promoting and maintaining an effective balance of jobs and housing is, of course, another chicken-and-egg process that is very difficult to accomplish. Nevertheless, the argument is that when significant development occurs in such communities, it should be employment-driven and should be in response to local growth needs, rather than driven by the "external" needs of the GTA housing market. Put another way, such growth should emerge out of the local aspirations and strengths of the individual community, and should be locally focused in terms of its primary activity and travel patterns, rather than driven by externally oriented development pressures. 24. This categorization is not meant to be definitive, but only to structure the discussion somewhat. 25. As bad as this is for transportation sustainability, the "feedback" effects can further aggravate the situation. Once established, such communities often lobby for improved road facilities to relieve their onerous and congested commute as a "right" to which they feel entitled . Also, all local trip-making will be auto-based, given the single-purpose, relatively low-density nature of the typical development. 26. A study investigating the "total" cost of housing and travel in the GTA is forthcoming (see Miller et al., 2002) that addresses this question in detail.